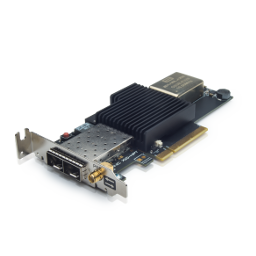 Exablaze - Blog - Exablaze High Precision Timing "NOW in picoseconds"
Exablaze High Precision Timing "NOW in picoseconds"
Sydney, February 14, 2017: Ultra Low Latency networking specialist Exablaze announces the release of the ExaNIC HPT, a dual-port 10GbE Network Interface Card (NIC) that enables High Precision Timestamping (HPT) to 250 picosecond resolution. The ExaNIC HPT delivers a breakthrough in resolution, improving the accuracy of measuring the time between events by more than a factor of magnitude over existing technologies - from single digit nanoseconds to 250 picoseconds, the time it takes a light signal to travel five centimetres (two inches) through an optical fibre. Enterprise Security where instant attack detection and forensic investigation are critical. Correlating events in networks has become a huge challenge, given the complexity and physical distances involved. Exablaze can now synchronize absolute time via its GPS time server, provide nanosecond resolution timestamping, and produce event-based differential timing with 250 picosecond resolution. Exablaze already manufactures low latency Network Interface Cards (NICs) such as the ExaNIC GM that serve as Precision Time Protocol (PTP) Grandmasters, offering tight synchronization with Coordinated Universal Time (UTC) from anywhere on the globe using on-board Global Navigation Satellite System (GNSS) receivers and atomic clocks (more information). The ExaNIC HPT supports the same driver stack as the ExaNIC X10, and can simultaneously be utilised as a standard low latency network card. Exablaze’s latest breakthrough means that High Precision Timestamping and Ultra Low Latency performance can work hand in hand, for the first time. Exablaze designs and manufactures Ultra Low Latency network devices for Financial Traders, Big Data Analytics, High Performance Computing, Data Centres and Telcos. Exablaze is a leader in Field Programmable Gate Array (FPGA) technology. Its products play a crucial role in computing environments where performance is critical, from North America to Europe, Asia and Australia.